"San Antonio ISD is innovating to integrate its schools. Is it leaving some behind in the process?" was first published by The Texas Tribune, a nonprofit, nonpartisan media organization that informs Texans — and engages with them — about public policy, politics, government and statewide issues. San Antonio ISD is innovating to integrate its schools. Is it leaving some behind in the process? By Alexa Ura and Aliyya Swaby December 4, 2018 *Clarification appended SAN ANTONIO — Shoulders hunched and a worried expression plastered on his face, Principal Brian Sparks walked briskly through the halls of Lamar Elementary toward the cafeteria. It was lunchtime on the first day of school in August, and Sparks alternated between directing students precariously balancing their lunch trays and milk cartons to their seats and helping calm a shrieking, red-faced kindergartner who refused to eat until teachers retrieved her mother. Loading... He spends half the week at Lamar and the other half at Bowden Academy, a pre-K through 8th grade school just a 10-minute drive south, where he was installed as principal this fall. Both schools enroll mostly low-income Hispanic students. But Lamar, a recently renovated school in a gentrifying neighborhood, is thriving thanks to an infusion of money and increased enrollment from inside and outside the district. Bowden, drab and dimly lit, is still struggling as it awaits an $11.1 million renovation financed through a 2016 bond. Sparks, one of San Antonio Independent School District's “network principals,” has been given more than $1 million in grants to replicate Lamar’s successes at Bowden, part of a larger effort to overhaul low-performing schools and boost falling enrollment across this inner-city district with 92 schools and about 49,000 students. Like many of its urban peers, San Antonio ISD has been losing thousands of students each year to private and charter schools, as well as to neighboring school districts — part of a national trend as parents gain more options for where to enroll their children. That declining enrollment has meant the loss of millions of dollars in state money for the district. But instead of shuttering schools with dropping enrollment — a move that often triggers community backlash — they’re redesigning them by offering popular education programs such as dual language or Montessori that are meant to serve as bait for families who otherwise might be paying for those offerings at private schools. The plan serves as a way to integrate some schools in what has historically been a majority Hispanic district by bringing students with vastly different socioeconomic backgrounds together in the same classrooms, an approach that is known to improve academic performance and overall life outcomes. It also is intended to cut down the number of schools in poor neighborhoods that have been low-performing for years. As more Texas public schools begin to resemble San Antonio ISD’s — with wealthier white students leaving and Hispanic students, who are more likely to be poor, in the majority — the district’s plan could become a blueprint for how to draw those families back while also improving schools for all students. 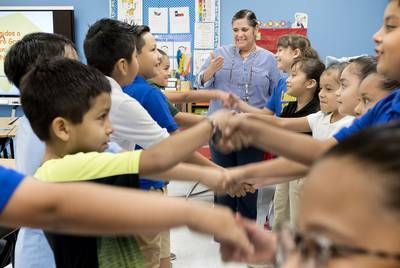 While racial segregation is far from a distant memory in many parts of the state, San Antonio ISD and most other Bexar County school districts are majority Hispanic, making socioeconomic integration a more feasible goal. “We feel that the things we’re seeing, you can actually apply to the entire state, whether it’s other urban districts or rural areas,” Superintendent Pedro Martinez said this spring while explaining his work to a state-run school funding panel. But it’s unclear whether San Antonio ISD’s educational experiment is financially sustainable. The plan is dependent on a combination of private donations and state and federal grants, but those dollars could run out. Because the district’s leaders cannot guarantee they can invest in all of its schools, they have to choose winners and losers as they divide limited resources in a system where 91 percent of students are considered economically disadvantaged by the state. Over the last five years, Sparks has made Lamar a winner with the help of an engaged corps of parents, some who gush about finding a school where their children can learn in Spanish and English, without having to shell out five-digit tuition payments. Families who had once opted out of sending their kids to the school have come back and some seats are open to students from other parts of the city. Behind an old schoolhouse facade, natural light streams through the windows of once-sparse classrooms that now burst with eager students. At Bowden, the atmosphere is much different. The parents are more likely to be working class and live in the neighborhood. They worry that class sizes are too big, teachers can’t keep disciplinary issues under control, and that their kids don’t often get to work on creative projects. Empty multi-colored lockers line the hallways instead of student drawings, and misshapen ceiling tiles hang awkwardly overhead. Many parents in the neighborhood are opting out, sending their kids to other public schools outside the district or private schools if they can afford it. Loading... But it’s Bowden’s similarities to Lamar that helped persuade district leaders to choose it for a major overhaul, funded by $1.3 million in federal grants this year and a promise of at least a million more next year. The neighborhood surrounding Bowden is also beginning to gentrify — shiny, modern row homes sit next to creaky, often dilapidated, historic ones. To district leaders, Bowden has the right ingredients to someday lure back families just as Lamar has. As Sparks splits time between the two schools, he knows Bowden’s teachers and students will benefit from his experience at Lamar. But he’s also uncomfortable with the strategy of pumping money and experienced leaders into certain schools as other students languish in high-poverty neighborhoods for years without seeing much improvement. “That doesn’t sit very well with me,” Sparks said. “But I don’t know the alternative. I think this is the right way to go. It just kind of is messy in the moment.” Innovation at a cost Looking out onto a standing-room-only crowd in the district’s boardroom near downtown, Martinez struggled to get through a financial presentation to the school board in May. He sat quietly for almost an hour, listening to scores of outraged teachers who were upset about layoffs and anxious parents who worried about the district’s trajectory. The few parents who showed up to praise the innovative programs that drew them to San Antonio ISD were drowned out. David Garza, a teacher and parent at De Zavala Elementary School, spoke out against the district’s “lack of transparency,” which he said had only intensified in the last three years. Protesting the district’s decision to hand over control of a low-performing school to a New York-based nonprofit, Garza told the board he was alarmed by the district’s overall strategy. “You had an opportunity to engage with all of SAISD with your plans for bringing charters into SAISD. You didn’t do so,” Garza said. San Antonio ISD Superintendent Pedro Martinez touts students' gains in high school graduation and college attendance as a sign the plan is working. Laura Skelding for The Texas Tribune Martinez’s subsequent attempts to mount a defense of the district’s decisions were punctuated by jeers from the large crowd of teachers, parents and community members who had packed the room in protest, holding up homemade signs that read “#byePedro.” Martinez and his team were navigating grim financial terrain. In the 2017-18 school year, 8,654 students living within San Antonio ISD's boundaries were attending privately managed public charter schools or nearby districts. That was a 3,242 increase from the previous school year. In 2016-17, the increase was just 396 over the previous year. That was more than district leaders expected, and they anticipated even more losses, so they cut their budget for 2018-19 by $31 million, or 6 percent, and laid off 132 teachers. At the same time, they vowed to continue pursuing partnerships with universities and nonprofits that would bring in more state dollars — but require the district to hand over the management of its schools to the new partners. Those decisions had triggered vehement resistance from parents and teachers concerned that the district was surrendering oversight of its most needy students — and their teachers — to outsiders and that it was focused on attracting new, wealthier students at the expense of its low-income students. Families from neighboring districts enrolling children in San Antonio ISD schools are far more likely to live in areas of higher socioeconomic status. “I’m speaking tonight as an SAISD parent — one who doesn’t shop for my child’s school,” said Sarah Sorenson, the parent of a third-grader at Bonham Academy. Sorenson was practically yelling when she told the board that it was forcing teachers, and consequently students, to “bear the brunt” of ill-informed decisions. “Families are sending a message — they are looking for options, and when those options exist, they are going to those options,” Martinez managed to get out at one point. “And so for us, it just confirms the direction we have to go and we have to continue to support our schools.” When Martinez arrived in mid-2015, San Antonio ISD consistently received low ratings from the state, and so did many of its schools, putting its performance below other urban districts in Texas. Frustrated teachers took jobs in districts with fewer problems — and were nearly impossible to lure back. San Antonio ISD had made some progress in the last few years, relaunching low-performing schools on the verge of closure and bringing in new students — and the state money that comes with them. District leaders were also banking on a significant tax hike passed in 2016 to help. But that still wasn't enough. Charting a new path Hunched over his laptop, Mohammed Choudhury, the district’s chief innovation officer, sat near the front of the reserved staff section and looked spent as the crowd at the May board meeting criticized how the district was implementing the plan he helped mastermind. In an interview months later, Choudhury chalked up the anger to a small group of union-affiliated teachers clinging to the status quo and resisting the district’s attempts at “disrupting mediocrity.” “You’re not doing anything if you’re not loved and hated while you’re trying to create change,” he said. Hired in the spring of 2017, Choudhury has big plans for the district. 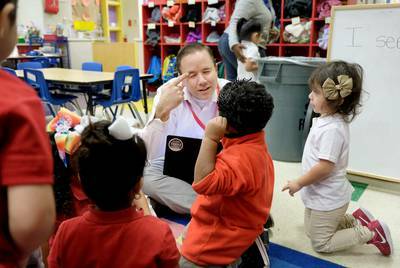 Following a stint at Dallas ISD where he led a similar charge, he’s responsible for helping overhaul low-performing schools by relaunching them with innovative instructional models that will tap into what he describes as a “sea of affluence” in San Antonio. A product of diverse Los Angeles public schools, he’s confident students can be successful in schools where most of them are poor. As San Antonio ISD relaunches its low-performing schools with an eye on attracting wealthier families, Choudhury said he’s committed to ensuring they remain accessible for the low-income children who live around them. After more than a year working in one of the country’s most socioeconomically segregated cities, Choudhury has perfected his pitch: “While we do high poverty schools well — and we need to and we can figure them out … we’re going to stop re-creating them where we can.” Loading... The nation’s seventh-largest city, San Antonio is home to a constellation of school districts born out of deep-rooted housing segregation that shut black and Hispanic residents out of high and middle-income neighborhoods through deed restrictions. Texas’ present-day school districts began forming in the late 1940s, spurred in part by the financial incentives the state Legislature offered if they consolidated with others, to save the state money. As they negotiated, wealthier districts considered the financial liability they were willing to take on from neighboring districts — and many spurned lower-wealth districts like San Antonio, which ended up merging with several other relatively poor districts. The result was a public school system with districts whose student populations “were intended to be homogenous when they were built,” said Christine Drennon, associate professor and director of the urban studies program at Trinity University in San Antonio. After those mergers came the 1954 Brown v. Board of Education desegregation decision, which triggered white flight from San Antonio ISD and school districts across the country. Wealthier white families largely settled in the northern end of Bexar County, while black and Hispanic students were concentrated in the inner city. Over the years, many in San Antonio’s Hispanic middle class have moved to the northern part of the county — where the school districts remain wealthier — while most of the black middle class has abandoned San Antonio altogether. That left poor black and Hispanic children in inner-city schools — many of them within San Antonio ISD’s boundaries — without enough children to fill them, Drennon said. Choudhury has built a two-pronged approach to overcoming those historic divides that seems both parts practical and idealistic. 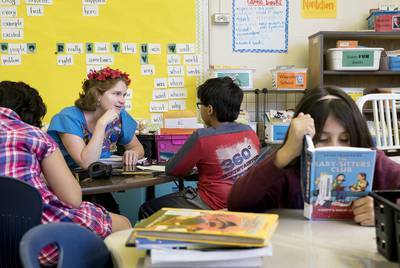 The first part entails increasing diversity at about 30 of the district’s 92 schools, with a percentage of seats at those schools reserved for students from lower socioeconomic backgrounds and students who live outside of the district’s boundaries. One of them is Steele Montessori Academy, launched in 2017 in a school that was closed years ago. It runs from pre-K to second grade and enrolls a quarter of its students from outside the district and at least half from economically-disadvantaged families, prioritizing those in deep poverty and those who live within a two-mile radius of the school. Last year, it received more than 450 applications for 52 seats, leaving hundreds of families on the waitlist. The second part of Choudhury’s strategy includes collaborating with local universities and nonprofits in poor neighborhoods — which in some cases brings in additional state money. At Lamar, that meant partnering with Trinity University, which sent instructors to help revamp some of its curriculum. Meanwhile, Ogden Academy, a chronically low-performing pre-K through 7th grade school in one of the city’s poorest ZIP codes, now serves as a training ground for student teachers from the Relay Graduate School of Education, a teacher training program founded by charter school operators. The student teachers commit to work in the district for three years after graduation. Loading... Choudhury’s six-person department works out of a few rooms in a shuttered middle school on the city’s east side. On one wall, he’s hung an enormous map breaking down the poverty students face throughout the district, block by block: green blocks represent areas where the median household income hovers around $50,000, where parents are more likely to be college educated and most homes are two-parent households; red blocks represent areas where the median household income is $19,533 and where most households are led by single parents who are less likely to have college degrees. He and his colleagues in the innovation office have tried to get the word about their strategy and the programs the district offers out to every corner of that map. They’ve mailed flyers to hundreds of thousands of homes in the county and shaken hands with parents at festivals and health fairs. When the real-time data showed not enough Spanish-speaking children were applying to some specialized schools, they targeted those areas on the map for additional block-walking and recruitment. But the district’s plan has been met with resistance from some parents whose kids aren’t seeing any of its benefits. At De Zavala Elementary School, where almost every child is Hispanic and economically disadvantaged, Garza, a pre-K teacher and one of the parents who spoke at the board meeting, says he and four other teachers had to share 20 iPads between 60 kids last year. Garza has a fourth-grade son at De Zavala, in San Antonio's west side, and he’s watched fellow teachers spend months applying for grants to get classrooms outfitted with smart boards that are staples in the schools that the district has already prioritized. That’s what led Garza to address the school board at the May meeting. While Garza supports economic integration in San Antonio schools, he said he struggles with what he sees as the district’s tendency to play favorites, leaving campuses like his with fewer resources. “If you’re allocating so many funds to these boutique schools and then you’ve got other schools that are not getting those funds, that doesn’t seem right to me,” Garza said from the second floor of the local teachers union’s offices months after the board meeting. “I really take issue with that because I mean, in the meantime, who’s suffering? It’s our kids.” It’s possible schools like De Zavala will not receive that money. The district does not plan to put specialized programs or enrollment guidelines in every school, Choudhury acknowledged, but he’s hopeful that leaders' investments in technology and fine arts will eventually lift all schools. “Is it happening fast enough? Absolutely not. With competing resources and funding, it's not,” Choudhury said. “Their frustrations are warranted." Bonham Elementary School in San Antonio is an in-district charter with a lottery system. Third graders jump rope on the playground on May 9, 2018. Laura Skelding for The Texas Tribune At the Advanced Learning Academy at Euclid in San Antonio, second grade students read while their teacher works individually with students. (Starting bottom, then moving clockwise) Samantha Vandervort , Gabriel Lopez, Saiki Rosas, Kyle Perez (in chair) John Schweers (in chair), Tristan Poujol and Matthew Sanchez. Bexar County's school districts are among the most segregated in the state, with boundary lines historically drawn to consolidate resources. San Antonio ISD is working to create more socioeconomic and racial diversity through public school choice measures. Laura Skelding for The Texas Tribune Andrea Lucas teaches at Lamar Elementary School. Bexar County's school districts are among the most segregated in the state, with boundary lines historically drawn to consolidate resources. San Antonio ISD is working to create more socioeconomic and racial diversity through public school choice measures. 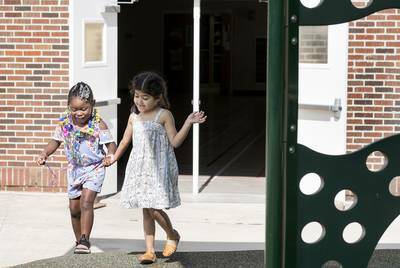 Laura Skelding for The Texas Tribune At Steele Montessori Academy, a formerly closed campus, Azeri’aha and Penelope Acuña hold hands and play during recess on April 26, 2018. Bexar County's school districts are among the most segregated in the state, with boundary lines historically drawn to consolidate resources. San Antonio ISD is working to create more socioeconomic and racial diversity through public school choice measures. 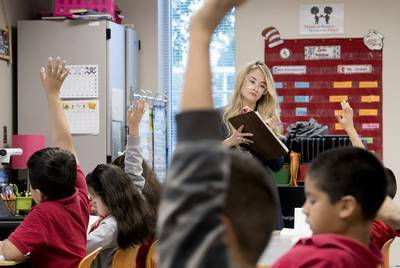 Laura Skelding for The Texas Tribune In one of the country's most socioeconomically segregated cities, San Antonio ISD is putting more money into its high-poverty schools while also working to integrate others. Laura Skelding for The Texas Tribune Questions of equity Despite the district’s efforts, parents are still leaving, and not just the affluent ones. 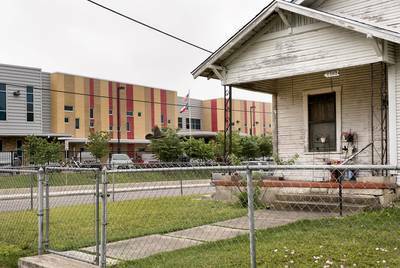 District officials have kept an eye on Sarah King Elementary, located in one of San Antonio’s poorest areas, because it has lost more than 100 students over the last four years — it’s among the top 20 schools with a more than 15 percent drop in enrollment. Diosis De La Sancha, a single mother with a fifth-grader at Sarah King, is strongly considering sending her child to a KIPP San Antonio charter school next year. KIPP’s schools accept students from throughout Bexar County and are among the largest competitors for students living within San Antonio ISD’s boundaries, siphoning off hundreds last year. De La Sancha hates that her 10-year-old is stuck in overcrowded classrooms, where she says teachers cannot control students’ physical fights. Most of those kids will probably go to the same middle school together, just a mile away in the same west San Antonio neighborhood, but she doesn’t want her son to be one of them. “The environment here isn’t so good. That’s what is motivating me to transfer him,” De La Sancha, a parent volunteer at the school, said in Spanish. “It’s not an easy decision, especially for him. He’s cried. I tell him, ‘Well, I want the best for you.’” De La Sancha also has considered San Antonio ISD’s Harris Middle School, which has a fast-paced curriculum that would challenge her son. But she thinks the KIPP school will be easier to get to from her home, and it goes up through high school. Other Sarah King parents are grappling with the same decisions. De La Sancha is close to persuading her fellow parent volunteer Maria Blanco, who doesn’t know how to drive, to consider the same school for her son. When Choudhury heard about De La Sancha and Blanco’s situation, he was unable to offer an easy solution. “I would love to meet them and talk to them,” he said. Maria Blanco is considering sending her son Sebastian to a charter school next year, instead of keeping him in San Antonio ISD. Laura Skelding for The Texas Tribune For all the money and energy Choudhury and his team have put into spreading the word about other options within the district like Harris Middle School, many parents and students appear to still rely on information spread word-of-mouth between neighbors, friends or family members. District leaders know some parents may never find out about those options. While parents like De La Sancha are thinking about leaving the district, wealthier parents outside the district are flooding it with applications for its more popular schools — which district leaders have taken as a sign their plan is working. “We could fill all the seats with out-of-district families, which politically would not be good for me, but we could actually do that for the first time,” Martinez told state education leaders this spring. “What families are saying to us is, this is the first time they’ve ever seen San Antonio as a district with great choices that they would want to go to.” The district’s newfound popularity has also forced leaders to confront the limitations of a school integration model that relies, in part, on parents' initiative and ability to seek better educational opportunities for their children. 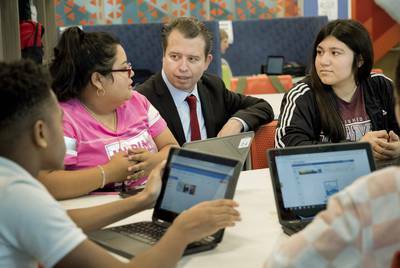 In advance of the fall 2016 opening of San Antonio ISD’s Advanced Learning Academy, which eschews traditional, structured instruction in favor of creative, self-paced projects, district officials received 1,000 applications for just 550 seats in what started as a kindergarten through 10th-grade campus. Loading... Some families living in the surrounding neighborhood, which is primarily low-income and home to many immigrants, had applied to ALA but got stuck on the waitlist, despite living blocks away, according to state Rep. Diego Bernal. Bernal, who lives in that neighborhood, realized that his constituents were left out and pointed out the discrepancy to district leaders, asking, “Are we sure that the way we’re doing this is working the way that it’s supposed to?” Choudhury acknowledged the misstep. Before his arrival, the district did not reserve seats for its poorest families in its magnet and specialized schools, meaning parents who knew how to navigate the system were more successful, he said. “I will never be a fan of this version of choice. It's not equitable. It's not right,” Choudhury said. “And you're exacerbating problems and inequities in cities where there are haves and have nots. So that needed a rewrite. That needed a redesign, and Superintendent Martinez was well aware of that.” In ALA’s second school year, with more affluent families clamoring to enroll, district leaders reserved half the seats for economically-disadvantaged students, prioritizing those living in the poorest areas and those living within two miles of the school. Some parents, accustomed to using their connections to get their children accepted, were upset at finding their kids on the waitlist, Choudhury said. "You hold your ground in those things because at the end of the day, that's why this administration has come together to do this work and transform outcomes for kids in the city," Choudhury said. The flip side of a fast push If the district’s fast-paced approach to overhauling some of its schools has been messy, it’s because it was launched with a sense of urgency, Martinez said. Enrollment was falling. Inner-city schools had been shuttered or were on the verge of closure. The state had given the district a low rating. And only half of the students graduating from San Antonio ISD schools were attending college — below the state average. “I wish the pace had been in some cases, in some ways a little slower,” Martinez said. “I think for a lot of our staff the pace has been very fast. The other side of that is just because the need is so urgent, and I struggle with that. You talk to these students and you talk to these families and you see these neighborhoods and you just want things to move very fast. And it’s tough.” The district is looking to slow things down, Martinez said, and get more community input about which schools should be next in line for improvements. 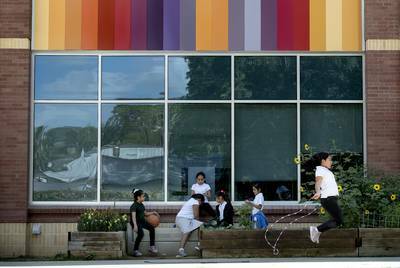 This year, Martinez and his team have asked principals to work with their parents to submit proposals for redesigning their neighborhood schools. More than 12 have already expressed interest. Regardless of the pace they want to set, money is still a huge hurdle. The district will likely face a deficit next year, as enrollment continues to decline, and it’s still competing with charter schools and other districts for students. Martinez appears defensive when asked about the criticism that he’s more interested in attracting affluent students from outside the district than meeting the needs of poor students left behind at schools that haven’t made the cut for new programs and money. “Right now, we have to create schools that people want to come to that are great options for everybody. Period,” he said. Loading... Martinez points to the gains the district has seen during his three-year tenure. More students are enrolling in advanced classes intended to prepare them for college. They are slowly growing the share of students going on to attend competitive universities. Fewer campuses are considered low-performing by the state. In two years, Martinez wants the share of students who are graduating high school in four years to grow from 83 percent to 90 percent. He wants to see 50 percent of students enrolling in four-year colleges — up from 25 percent. He also wants to pare down the number of schools that get low ratings from the state, which was 16 last year. But it’s unclear how his goals will play out at schools like Ogden Academy, which has received failing state ratings for five years straight, putting it at risk of strict state penalties. The school has a high rate of students who come and go in the middle of the academic year, and is located in a low-income neighborhood surrounded by rundown homes. 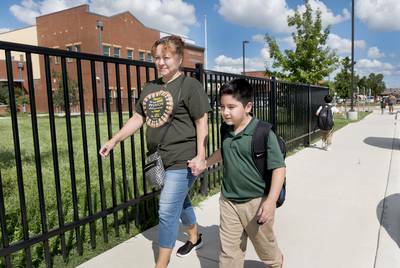 Though Ogden can enroll students from anywhere in the county, Principal Ixchell Gonzalez said she decided to prioritize keeping kids from the neighborhood. Ogden Elementary School in San Antonio. Bexar County's school districts are among the most segregated in the state, with boundary lines historically drawn to consolidate resources. San Antonio ISD is working to create more socioeconomic and racial diversity through public school choice measures. 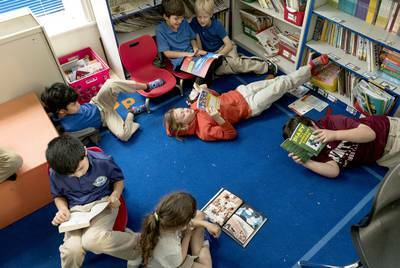 Laura Skelding for The Texas Tribune Corina Pannabecker teaches first grade at Ogden Elementary in San Antonio. Bexar County's school districts are among the most segregated in the state, with boundary lines historically drawn to consolidate resources. San Antonio ISD is working to create more socioeconomic and racial diversity through public school choice measures. Laura Skelding for The Texas Tribune A chronically low-performing school in a low-income neighborhood, Ogden Academy has seen numerous district efforts to put it on the path to success. Laura Skelding for The Texas Tribune The district has partnered with the Relay Graduate School of Education, which has experience working in high-poverty schools, to help turn Ogden around. “The school was out of control, teachers were upset, kids were running wild,” Martinez said, describing his first visit to Ogden in 2015. “Go there today, it’s a completely different school, same exact children.” Gonzalez has worried that parents will leave Ogden, wooed by offerings at other schools, such as the new dual-language program within walking distance at Irving Academy that allows kids to learn in both English and Spanish. But enrollment was steady last school year, she said, and parents in the neighborhood appreciate the new batch of committed teachers. “So far our families have chosen to stay,” she said. A dream comes true A longtime bilingual teacher at Lamar Elementary, Isabel Nava was beaming on the first day of school this fall. She had hoped to show up earlier that morning to make sure her classroom was ready for the 21 students she was welcoming — up from 12 the year before — as enrollment at Lamar continued to grow. But with time running short before the starting bell, she hurriedly jotted “Hola amigos” in bright blue marker on her erasable board and adjusted the alphabet letters in a large display board before speed-walking down to the school’s playground. It was the start of her 18th year of teaching at Lamar, but the past two years have been special for Nava and her colleagues. Isabel Nava still gets emotional when she remembers Lamar Elementary's falling enrollment, before parents began flocking to attend. Laura Skelding for The Texas Tribune For years, they had watched enrollment fall as more parents in the neighborhood opted to place their children in other public schools or private schools. Things had only gotten worse when the community began to gentrify. In one summer, the school lost a fleet of students practically overnight when a developer demolished several nearby apartment buildings with little warning. Knowing Lamar was on the verge of shutdown, Nava worried about the children who would be left without their neighborhood school. She thought of the younger siblings of the students she had taught and wondered if they would be shipped off somewhere else. Then Sparks came on board, and Lamar partnered with Trinity University instructors who helped revitalize the curriculum, focusing on project-based learning. They extended the school year and set aside time each school day for teachers to help develop students’ social and emotional skills. And a collection of parents and staff came together to implement a successful dual-language program. Altogether, those efforts helped attract families from all over San Antonio and boosted enrollment. She choked up remembering the first day of school after Lamar’s transformation, when school staff had unrolled a red carpet at the entrance to welcome students back. “Everybody was outside with balloons. The children were entering the school through every doorway,” Nava said through tears. “That was my dream.” On the first day of school this fall, enrollment at Lamar Elementary hit 390 — up from 220 six years ago. At Bowden, English and science teacher Monica Martinez has seen class sizes grow, but it’s a sign of struggle more than progress. This year, 27 students in her seventh-grade English class have to squeeze around several clusters of desks in her classroom. Student enrollment has decreased in the last year, forcing the school’s leaders to consolidate classrooms. Now, she has trouble making sure all her students are engaged at all times — which Sparks notes in his regular observations of her class. She said she feels challenged and supported by the regular feedback, and feels optimistic about his goal of using Lamar’s successes to push Bowden teachers to do better for students. “He definitely is giving us the resources to change up things in the classroom,” she said. In late fall, Sparks hosted a meeting for parents just after students arrived for the day, to explain the new structure that had him splitting his time between two schools. About 20 eager parents separated across a few tables, divided into Spanish and English speakers, and discussed what they wanted from Bowden’s future. “We need your feedback to figure out what you love about our school and how we could make it better,” Sparks said, with the help of a Spanish translator. He asked whether they would want to partner with a nonprofit or university, like Lamar did, and develop a specialized program to attract students from outside the community — though, he reassured them, neighborhood students would always have a place at Bowden. Sitting with another seven Spanish-speaking parents, Claudia Rodriguez, who has a fifth-grader at Bowden, was quick to point out things that needed to improve — such as overcrowded classrooms and the need for more challenging student activities — but also said she trusts Sparks as a leader. In past years, she noted the continued neglect at Bowden, visible when she walked through the halls. The building was often dirty, she recalled, and trash piled up outside the school. “Yes, there is more work needed, but the school is getting a lot better. We’re happy with the principal because he’s very attentive,” she said in Spanish. Sparks is hoping to replicate Lamar's success at Bowden, as a "network principal" of both schools. Laura Skelding for The Texas Tribune Sparks knows that improving Bowden won’t be a quick fix. In a recent interview, he recalled talking to a parent at Lamar years ago, as she considered enrolling her child in the school. She asked him if he would feel comfortable placing his child in every single classroom on the campus. “And the answer was, if I had to put them in this school today, the answer would be no,” he told her then. Five years later, on top of Lamar’s increased enrollment, teachers like Nava are staying longer and even looking for new ways to be leaders on campus. And teachers and staff at Bowden, like Martinez, are excited to learn new ways of connecting with students in the classroom, he said. “We just need time,” Sparks said before pausing for a moment and nodding to himself. “It just takes time.” Ryan Murphy contributed to this report. Clarification: This story has been updated to clarify the extent of San Antonio ISD’s enrollment loss. Read related Tribune coverage Here's our talk with NPR's 1A on Longview ISD and our school segregation series It took this Texas school district 48 years to desegregate. Now, some fear a return to the past. Watch: A symposium previewing the 86th legislative session "San Antonio ISD is innovating to integrate its schools. Is it leaving some behind in the process?" was first published at by The Texas Tribune, a nonprofit, nonpartisan media organization that informs Texans — and engages with them — about public policy, politics, government and statewide issues. Link back to the original article, which is located at https://www.texastribune.org/2018/12/04/san-antonio-isd-school-integration/.